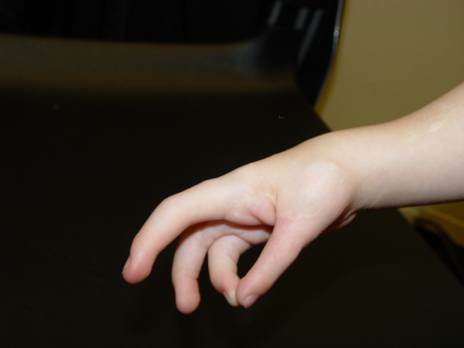 Treatment for thumb aplasia and hypoplasia depends on the severity of the condition and the nature of any associated congenital abnormalities. For thumb aplasia or hypoplasia, the recommended treatment strategy is a pollicization surgery, which reconstructs the index finger into a thumb (see below). An initial evaluation will include assessment of the patient’s hand, including tendon and skin abnormalities, stability of joints, and web-space tightness. This will allow Dr. Paley or Dr. Robbins to recommend an appropriate treatment plan. Evaluation for associated anomalies is also essential during the initial consultation and may include cardiac tests and kidney and abdomen ultrasounds. A blood smear and complete blood count, as well as a chromosomal challenge test may be recommended to rule out Fanconi anemia. For thumb aplasia or hypoplasia, the recommended treatment strategy is a pollicization surgery. Dr. Paley treats absent or hypoplastic thumb with a pollicization (surgical construction) of the index finger. Dr. Paley will surgically migrate the index finger to the thumb position. The index finger metacarpal (bone) is cut and the finger rotated and replaced at the base of the hand, the normal position of the thumb. It is critical to preserve all of the thumbs circulation and sensation. Dr. Paley does this by first finding all of the veins, arteries and nerves and making sure they are not compromised by the repositioning. To restore the movement of the thumb to as normal as possible he transfers several muscles to new locations. The thumb is normally 135 degrees rotated to the fingers. It is critical to get it into the correct position for it to function as a thumb and not a finger. Its length should be adjusted so that the tip of the thumb is at the level of the adjacent finger's PIP joint. Too often this operation is done incorrectly with the thumb not adequately rotated, too long, or with too much hyperextension. Dr. Paley is very careful to adequately rotate the thumb to the most functional position and to adjust the length of the new thumb correctly. He positions it such that the thumb cannot hyperextend. This gives the thumb maximum stability and focuses the mobility of the thumb towards pinch and opposition: the two main functions of the thumb. The combination of these steps also gives the thumb an excellent cosmetic appearance. When pollicization and ulnarization are required, the ulnarization is done first followed several months later by the pollicizaiton either at the time of pin removal or at a separate time. In some cases if the muscles of the thumb are not adequate, Dr. Paley transfers muscles from other parts of the hand to improve the movement (e.g. Huber opponensplasty).